The Division 2's beta is set to go live this February 7th and today Ubisoft provided a trailer showcasing what players can expect from the testing period. The beta will offer 2 main mission and 5 side missions, including Dark Zone sections for both PvP and PvE fights. The player can join 4v4 PvP Skirism matches and surprisingly end game content with 1 Invaded Mission that unlocks on February 8th. Players can pick up to 3 different levels 30 specialists to play in the Invaded mission. It should be noted that players can only create one character that cannot be deleted and appearance will be generated based on preset options provided by Ubisoft. 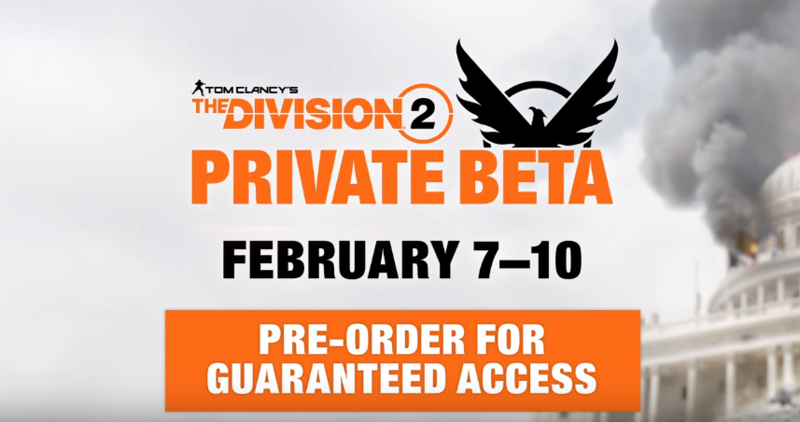 The Division 2 Private Beta starts February 7! In the Beta you’ll be able to play two Main Missions, get a glimpse of the Endgame with one Invaded Mission, try out the three Endgame Specializations, explore one of the revamped Dark Zones, play 4v4 PvP and much more. Tom Clancy’s The Division 2 is scheduled to release on March 15, 2019, for PC, PlayStation 4, and Xbox One.